The Comtek BST 75-216 CW Synthesized Base Station Transmitter with Companded and Non-Companded Channels is designed for rackmount or sound cart use. 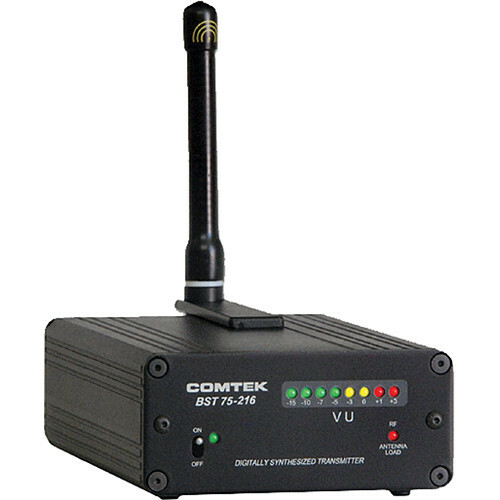 It can transmit on both companded and non-companded channels, allowing the BST 75-216 CW to be used with optional Comtek or third party receivers. The unit features flash memory channel programmability and is protected by an all-metal enclosure. Its combo XLR/TRS input provides support for mic and line levels sources as well as electret microphone headsets. Box Dimensions (LxWxH) 11.4 x 9.1 x 4.6"